Chloroplasts are carbon dioxide in a process known as the Calvin cycle. Chloroplasts carry out a number of other functions, including fatty acid synthesis, much amino acid synthesis, and the immune response in plants. A chloroplast is one of three types of plastids, characterized by its high concentration of chlorophyll. (The other two types, the leucoplast and the chromoplast, contain little chlorophyll and do not carry out photosynthesis.) Chloroplasts are highly dynamic—they circulate and are moved around within plant cells, and occasionally pinch in two to reproduce. Their behavior is strongly influenced by environmental factors like light color and intensity. Chloroplasts, like mitochondria, contain their own DNA, which is thought to be inherited from their ancestor—a photosynthetic cyanobacterium that was engulfed by an early eukaryotic cell. Chloroplasts cannot be made by the plant cell, and must be inherited by each daughter cell during cell division. With one exception (a member of the genus secondary and even tertiary endosymbiotic events. The word chloroplast (χλωροπλάστης) is derived from the Greek words chloros (χλωρός), which means green, and plastes (πλάστης), which means "the one who forms". Chloroplasts are one of many types of organelles in the plant cell. They are considered to have originated from ærobic prokaryote was engulfed. This origin of chloroplasts was first suggested by Russian biologist Konstantin Mereschkowski in 1905 after Andreas Schimper observed that chloroplasts closely resemble cyanobacteria in 1883. Chloroplasts are only found in plants and algae. 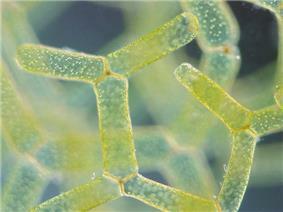 Cyanobacteria are considered the ancestors of chloroplasts. They are sometimes called blue-green phycobilisomes attached to the outside of the thylakoid membranes (phycobilins are not shared with all chloroplasts though). 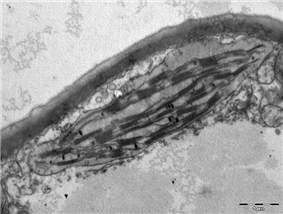 A eukaryote with  It is important to note that the cyanobacterial endosymbiont already had a double membrane—the phagosomal vacuole-derived membrane was lost. This event is called endosymbiosis, or "cell living inside another cell". The cell living inside the other cell is called the endosymbiont; the endosymbiont is found inside the host cell. Whether or not chloroplasts came from a single endosymbiotic event, or many independent engulfments across various eukaryotic lineages has been long debated, but it is now generally held that all organisms with chloroplasts either share cyanobacterium 600–1600 million years ago. These chloroplasts, which can be traced back directly to a cyanobacterial ancestor are known as primary plastids ("plastid" in this context means the almost the same thing as chloroplast). All primary chloroplasts belong to one of three chloroplast lineages—the glaucophyte chloroplast lineage, the rhodophyte, or red algal chloroplast lineage, or the chloroplastidan, or green chloroplast lineage. The second two are the largest, and the green chloroplast lineage is the one that contains the land plants. The alga cyanobacterial parent. For this reason, glaucophyte chloroplasts are also known as muroplasts. Glaucophyte chloroplasts also contain concentric unstacked thylakoids which surround a carboxysome, an icosahedral structure that glaucophyte chloroplasts and cyanobacteria keep their carbon fixation enzyme rubisco in. The starch they synthesize collects outside the chloroplast. Like cyanobacteria, glaucophyte chloroplast thylakoids are studded with light collecting structures called phycobilisomes. For these reasons, glaucophyte chloroplasts are considered a primitive intermediate between cyanobacteria and the more evolved chloroplasts in red algae and plants. The rhodophyte, or red algal chloroplast group is another large and diverse chloroplast lineage. Rhodophyte chloroplasts are also called rhodoplasts, literally "red chloroplasts". Rhodoplasts have a double membrane with an intermembrane space and phycobilisomes on the thylakoid membranes, preventing their thylakoids from stacking. Some contain pyrenoids. 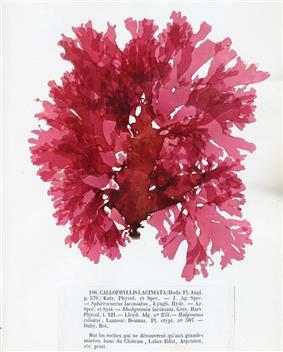 Rhodoplasts have chlorophyll a and phycobilins for photosynthetic pigments; the phycobilin phycoerytherin is responsible for giving many red algae their distinctive red color. However, since they also contain the blue-green chlorophyll a and other pigments, many are reddish to purple from the combination. The red phycoerytherin pigment is an adaptation to help red algae catch more sunlight in deep water—as such, some red algae that live in shallow water have less phycoerytherin in their rhodoplasts, and can appear more greenish. Rhodoplasts synthesize a form of starch called floridean, which collects into granules outside the rhodoplast, in the cytoplasm of the red alga. 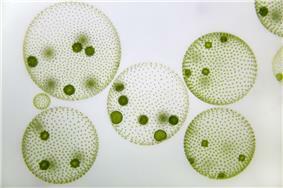 Diversity of green algae Clockwise from top left: Scenedesmus, Micrasterias, Hydrodictyon, Stigeoclonium, Volvox. Green algal chloroplasts are characterized by their pigments chlorophyll a and chlorophyll b which give them their green color. The green algae and land plants. They differ from glaucophyte and red algal chloroplasts in that they have lost their phycobilisomes, and contain chlorophyll b instead. Most green chloroplasts are (obviously) green, though some aren't, like some forms of Hæmatococcus pluvialis, due to accessory pigments that override the chlorophylls' green colors. Chloroplastidan chloroplasts have lost the peptidoglycan wall between their double membrane, and have replaced it with an intermembrane space. Some plants seem to have kept the genes for the synthesis of the peptidoglycan layer, though they've been repurposed for use in chloroplast division instead. The helicosproidia are nonphotosynthetic parasitic green algae that are thought to contain a vestigial chloroplast. Genes from a chloroplast and nuclear genes indicating the presence of a chloroplast have been found in helicosporoidia. even if nobody's seen the chloroplast itself. While primary chloroplasts have a double membrane from their cyanobacterial ancestor, secondary chloroplasts have additional membranes outside of the original two, as a result of the secondary endosymbiotic event, when a nonphotosynthetic eukaryote engulfed a chloroplast-containing alga but failed to digest it—much like the cyanobacterium at the beginning of this story. The engulfed alga was broken down, leaving only its chloroplast, and sometimes its cell membrane and nucleus, forming a chloroplast with three to four membranes—the two cyanobacterial membranes, sometimes the eaten alga's cell membrane, and the phagosomal vacuole from the host's cell membrane. The genes in the phagocytosed eukaryote's nucleus are often transferred to the secondary host's nucleus. Cryptomonads and chlorarachniophytes retain the phagocytosed eukaryote's nucleus, an object called a nucleomorph, located between the second and third membranes of the chloroplast. 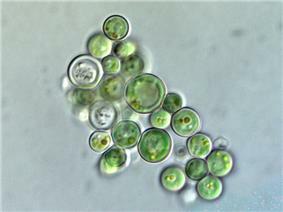 Green algae have been taken up by the euglenids, chlorarachniophytes, a lineage of dinoflagellates, and possibly the ancestor of the chromalveolates in three or four separate engulfments. Many green algal derived chloroplasts contain pyrenoids, but unlike chloroplasts in their green algal ancestors, starch collects in granules outside the chloroplast. 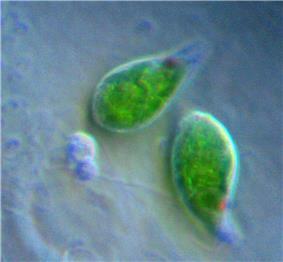 Euglenophytes are a group of common flagellated protists that contain chloroplasts derived from a green alga. Euglenophyte chloroplasts have three membranes—it is thought that the membrane of the primary endosymbiont was lost, leaving the cyanobacterial membranes, and the secondary host's phagosomal membrane. Euglenophyte chloroplasts have a pyrenoid and thylakoids stacked in groups of three. Starch is stored in the form of paramylon, which is contained in membrane-bound granules in the cytoplasm of the euglenophyte. though their story is more complicated than that of the euglenophytes. 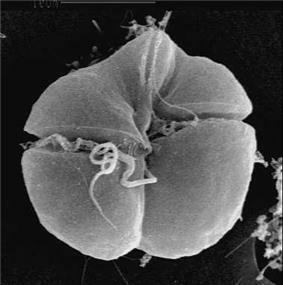 The ancestor of chlorarachniophytes is thought to have been a chromalveolate, a eukaryote with a red algal derived chloroplast. It is then thought to have lost its first red algal chloroplast, and later engulfed a green alga, giving it its second, green algal derived chloroplast. Chlorarachniophyte chloroplasts are bounded by four membranes, except near the cell membrane, where the chloroplast membranes fuse into a double membrane. Their thylakoids are arranged in loose stacks of three. Chlorarachniophytes have a form of starch called chrysolaminarin, which they store in the cytoplasm, often collected around the chloroplast pyrenoid, which bulges into the cytoplasm. Chlorarachniophyte chloroplasts are notable because the green alga they are derived from has not been completely broken down—its nucleus still persists as a nucleomorph found between the second and third chloroplast membranes—the periplastid space, which corresponds to the green alga's cytoplasm. 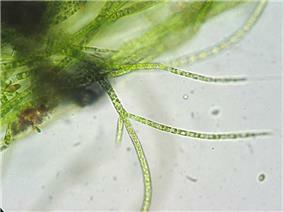 Recent research has suggested that the ancestor of the chromalveolates acquired a green algal prasinophyte endosymbiont. The green algal derived chloroplast was lost and replaced with a red algal derived chloroplast, but not before contributing some of its genes to the early chromalveolate's nucleus. The presence of both green algal and red algal genes in chromalveolates probably helps them thrive under fluctuating light conditions. Like green algae, red algae have also been taken up in secondary endosymbiosis, though it is thought that all red algal derived chloroplasts are descended from a single red alga that was engulfed by an early chromalveolate, giving rise to the chromalveolates, some of which, like the ciliates, subsequently lost the chloroplast. This is still debated though. Pyrenoids and stacked thylakoids are common in chromalveolate chloroplasts, and the outermost membrane of many are continuous with the rough endoplasmic reticulum and studded with ribosomes. They have lost their phycobilisomes and exchanged them for chlorophyll c, which isn't found in primary red algal chloroplasts themselves. 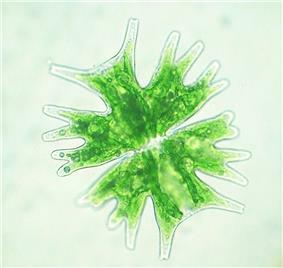 Cryptophytes, or cryptomonads are a group of algae that contain a red-algal derived chloroplast. 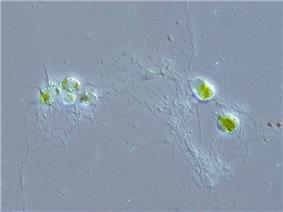 Cryptophyte chloroplasts contain a nucleomorph that superficially resembles that of the chlorarachniophytes. Cryptophyte chloroplasts have four membranes, the outermost of which is continuous with the rough endoplasmic reticulum. They synthesize ordinary starch, which is stored in granules found in the periplastid space—outside the original double membrane, in the place that corresponds to the red alga's cytoplasm. Inside cryptophyte chloroplasts is a pyrenoid and thylakoids in stacks of two. 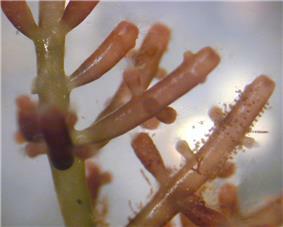 Haptophytes are similar and closely related to cryptophytes, and are thought to be the first chromalveolates to branch off. Their chloroplasts lack a nucleomorph, their thylakoids are in stacks of three, and they synthesize chrysolaminarin sugar, which they store completely outside of the chloroplast, in the cytoplasm of the haptophyte. The heterokontophytes, also known as the stramenopiles, are a very large and diverse group of algae that also contain red algal derived chloroplasts. Heterokonts include the diatoms and the brown algae, golden algae, and yellow-green algae. Heterokont chloroplasts are very similar to haptophyte chloroplasts, containing a pyrenoid, triplet thylakoids, and with some exceptions, having an epiplastid membrane connected to the endoplasmic reticulum. Like haptophytes, heterokontophytes store sugar in chrysolaminarin granules in the cytoplasm. Heterokontophyte chloroplasts contain chlorophyll a and with a few exceptions chlorophyll c, but also have carotenoids which give them their many colors. a It is now suspected that Chromalveolata is paraphyletic to Rhizaria. Apicomplexans are another group of chromalveolates. Like the helicosproidia, they're parasitic, and have a nonphotosynthetic chloroplast. They were once thought to be related to the helicosproidia, but it is now known that the helicosproida are green algae rather than chromalveolates. The apicomplexans include Plasmodium, the malaria parasite. 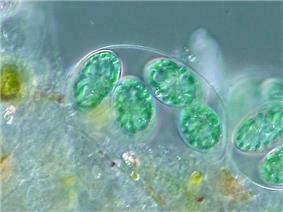 Many apicomplexans keep a vestigial red algal derived chloroplast called an apicoplast, which they inherited from their ancestors. 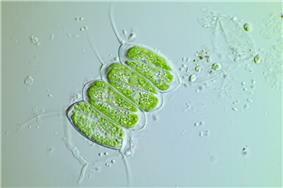 Other apicomplexans like Cryptosporidium have lost the chloroplast completely. Apicomplexans store their energy in amylopectin starch granules that are located in their cytoplasm, even though they are nonphotosynthetic. Most dinophyte chloroplasts are secondary red algal derived chloroplasts, like other chromalveolate chloroplasts. Many other dinophytes have lost the chloroplast (becoming the nonphotosynthetic kind of dinoflagellate), or replaced it though tertiary endosymbiosis—the engulfment of another chromalveolate containing a red algal derived chloroplast. Others replaced their original chloroplast with a green algal derived one. Most dinophyte chloroplasts contain at least the photosynthetic pigments chlorophyll a, chlorophyll c2, beta-carotene, and at least one dinophyte-unique xanthophyll (peridinin, dinoxanthin, or diadinoxanthin), giving many a golden-brown color. All dinophytes store starch in their cytoplasm, and most have chloroplasts with thylakoids arranged in stacks of three. The most common dinophyte chloroplast is the peridinin-type chloroplast, characterized by the carotenoid pigment peridinin in their chloroplasts, along with chlorophyll a and chlorophyll c2. Peridinin is not found in any other group of chloroplasts. The peridinin chloroplast is bounded by three membranes (occasionally two), having lost the red algal endosymbiont's original cell membrane. The outermost membrane is not connected to the endoplasmic reticulum. They contain a pyrenoid, and have triplet-stacked thylakoids. Starch is found outside the chloroplast An important feature of these chloroplasts is that their chloroplast DNA is highly reduced and fragmented into many small circles. Most of the genome has migrated to the nucleus, and only critical photosynthesis-related genes remain in the chloroplast. The peridinin chloroplast is thought to be the dinophytes' "original" chloroplast, which has been lost, reduced, replaced, or has company in several other dinophyte lineages. The fucoxanthin dinophyte lineages (including Karlodinium and Karenia) lost their original red algal derived chloroplast, and replaced it with a new chloroplast derived from a haptophyte endosymbiont. Karlodinium and Karenia probably took up different heterokontophytes. Because the haptophyte chloroplast has four membranes, tertiary endosymbiosis would be expected to create a six membraned chloroplast, adding the haptophyte's cell membrane and the dinophyte's phagosomal vacuole. However, the haptophyte was heavily reduced, stripped of a few membranes and its nucleus, leaving only its chloroplast (with its original double membrane), and possibly one or two additional membranes around it. 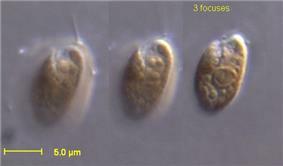 Some dinophytes, like Kryptoperidinium and Durinskia have a diatom (heterokontophyte) derived chloroplast. These chloroplasts are bounded by up to five membranes, (depending on whether you count the entire diatom endosymbiont as the chloroplast, or just the red algal derived chloroplast inside it). The diatom endosymbiont has been reduced relatively little—it still retains its original mitochondria, and has endoplasmic reticulum, ribosomes, a nucleus, and of course, red algal derived chloroplasts—practically a complete cell, all inside the host's endoplasmic reticulum lumen. However the diatom endosymbiont can't store its own food—its starch is found in granules in the dinophyte host's cytoplasm instead. The diatom endosymbiont's nucleus is present, but it probably can't be called a nucleomorph because it shows no sign of genome reduction, and might have even been expanded. Diatoms have been engulfed by dinoflagellates at least three times. The diatom endosymbiont is bounded by a single membrane, inside it are chloroplasts with four membranes. Like the diatom endosymbiont's diatom ancestor, the chloroplasts have triplet thylakoids and pyrenoids. In some of these genera, the diatom endosymbiont's chloroplasts aren't the only chloroplasts in the dinophyte. The original three-membraned peridinin chloroplast is still around, converted to an eyespot. Lepidodinium viride and its close relatives are dinophytes that lost their original peridinin chloroplast and replaced it with a green algal derived chloroplast (more specifically, a prasinophyte). Lepidodinium is the only dinophyte that has a chloroplast that's not from the rhodoplast lineage. The chloroplast is surrounded by two membranes and has no nucleomorph—all the nucleomorph genes have been transferred to the dinophyte nucleus. The endosymbiotic event that led to this chloroplast was serial secondary endosymbiosis rather than tertiary endosymbiosis—the endosymbiont was a green alga containing a primary chloroplast (making a secondary chloroplast). While most chloroplasts originate from that first set of endosymbiotic events,  but much larger than the approximately 150,000 base pair genome of the more assimilated chloroplast. Chromatophores have transferred much less of their DNA to the nucleus of their host. About 0.3–0.8% of the nuclear DNA in Paulinella is from the chromatophore, compared with 11–14% from the chloroplast in plants. 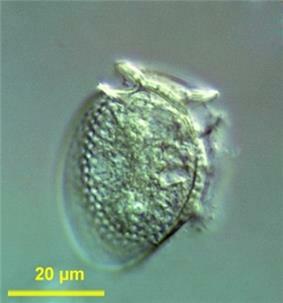 In some groups of mixotrophic protists, like some dinoflagellates, chloroplasts are separated from a captured alga or diatom and used temporarily. These klepto chloroplasts may only have a lifetime of a few days and are then replaced. Chloroplasts have their own DNA, often abbreviated as ctDNA, or cpDNA. It is also known as the plastome. Its existence was first proved in 1962, and first sequenced in 1986—when two Japanese research teams sequenced the chloroplast DNA of liverwort and tobacco. Since then, hundreds of chloroplast DNAs from various species have been sequenced, but they're mostly those of land plants and green algae—glaucophytes, red algae, and other algal groups are extremely underrepresented, potentially introducing some bias in views of "typical" chloroplast DNA structure and content. With few exceptions, most chloroplasts have their entire chloroplast genome combined into a single large ring, typically 120,000–170,000 base pairs long. They can have a contour length of around 30–60 micrometers, and have a mass of about 80–130 million daltons. Many chloroplast DNAs contain two inverted repeats, which separate a long single copy section (LSC) from a short single copy section (SSC). While a given pair of inverted repeats are rarely completely identical, they are always very similar to each other, apparently resulting from concerted evolution. The inverted repeat regions are highly conserved among land plants, and accumulate few mutations. Similar inverted repeats exist in the genomes of cyanobacteria and the other two chloroplast lineages (glaucophyta and rhodophyceæ), suggesting that they predate the chloroplast, though some chloroplast DNAs have since lost or flipped the inverted repeats (making them direct repeats). It is possible that the inverted repeats help stabilize the rest of the chloroplast genome, as chloroplast DNAs which have lost some of the inverted repeat segments tend to get rearranged more. New chloroplasts may contain up to 100 copies of their DNA, though the number of chloroplast DNA copies decreases to about 15–20 as the chloroplasts age. They are usually packed into nucleoids which can contain several identical chloroplast DNA rings. Many nucleoids can be found in each chloroplast. In primitive red algae, the chloroplast DNA nucleoids are clustered in the center of the chloroplast, while in green plants and green algae, the nucleoids are dispersed throughout the stroma. The chloroplast genome most commonly includes around 100 genes which code for a variety of things, mostly to do with the operons. Interestingly though, unlike prokaryotic DNA molecules, chloroplast DNA molecules contain introns (plant mitochondrial DNAs do too, but not human mtDNAs). Over time, many parts of the chloroplast genome were transferred to the nuclear genome of the host, a process called endosymbiotic gene transfer. As a result, the chloroplast genome is heavily reduced compared to that of free-living cyanobacteria. Chloroplasts may contain 60–100 genes whereas cyanobacteria often have more than 1500 genes in their genome. Endosymbiotic gene transfer is how we know about the lost chloroplasts in many chromalveolate lineages. Even if a chloroplast is eventually lost, the genes it donated to the former host's nucleus persist, providing evidence for the lost chloroplast's existence. 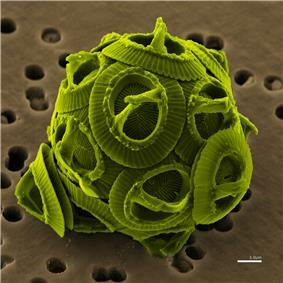 For example, while diatoms (a heterokontophyte) now have a red algal derived chloroplast, the presence of many green algal genes in the diatom nucleus provide evidence that the diatom ancestor (probably the ancestor of all chromalveolates too) had a green algal derived chloroplast at some point, which was subsequently replaced by the red chloroplast. Of the approximately three-thousand proteins found in chloroplasts, some 95% of them are encoded by nuclear genes. Many of the chloroplast's protein complexes consist of subunits from both the chloroplast genome and the host's nuclear genome. As a result, protein synthesis must be coordinated between the chloroplast and the nucleus. The chloroplast is mostly under nuclear control, though chloroplasts can also give out signals regulating gene expression in the nucleus, called retrograde signaling. Curiously, around half of the protein products of transferred genes aren't even targeted back to the chloroplast. Many became exaptations, taking on new functions like participating in cell division, protein routing, and even disease resistance. A few chloroplast genes found new homes in the mitochondrial genome—most became nonfunctional pseudogenes, though a few tRNA genes still work in the mitochondrion. Some transferred chloroplast DNA protein products get directed to the secretory pathway (though it should be noted that many secondary plastids are bounded by an outermost membrane derived from the host's cell membrane, and therefore topologically outside of the cell, because to reach the chloroplast from the cytosol, you have to cross the cell membrane, just like if you were headed for the extracellular space. In those cases, chloroplast-targeted proteins do initially travel along the secretory pathway). In most, but not all cases, nuclear-encoded chloroplast proteins are translated with a cleavable transit peptide that's added to the N-terminus of the protein precursor. Sometimes the transit sequence is found on the C-terminus of the protein, or within the functional part of the protein. After a chloroplast polypeptide is synthesized on a ribosome in the cytosol, an enzyme specific to chloroplast proteins phosphorylates, or adds a phosphate group to many (but not all) of them in their transit sequences. Phosphorylation helps many proteins bind the polypeptide, keeping it from folding prematurely. This is important because it prevents chloroplast proteins from assuming their active form and carrying out their chloroplast functions in the wrong place—the cytosol. At the same time, they have to keep just enough shape so that they can be recognized by the chloroplast. These proteins also help the polypeptide get imported into the chloroplast. In  (for example some species of Chlorella have a cup-shaped chloroplast that occupies much of the cell). All chloroplasts have at least three membrane systems—the outer chloroplast membrane, the inner chloroplast membrane, and the thylakoid system. Chloroplasts that are the product of secondary endosymbiosis may have additional membranes surrounding these three. Inside the outer and inner chloroplast membranes is the chloroplast stroma, a semi-gel-like fluid that makes up much of a chloroplast's volume, and in which the thylakoid system floats. There are some common misconceptions about the outer and inner chloroplast membranes. The fact that chloroplasts are surrounded by a double membrane is often cited as evidence that they are the descendants of endosymbiotic cyanobacteria. This is often interpreted as meaning the outer chloroplast membrane is the product of the host's cell membrane infolding to form a vesicle to surround the ancestral cyanobacterium—which is not true—both chloroplast membranes are homologous to the cyanobacterium's original double membranes. The chloroplast double membrane is also often compared to the mitochondrial double membrane. This is not a valid comparison—the inner mitochondria membrane is used to run proton pumps and carry out oxidative phosphorylation across to generate ATP energy. The only chloroplast structure that can considered analogous to it is the internal thylakoid system. Even so, in terms of "in-out", the direction of chloroplast H+ ion flow is in the opposite direction compared to oxidative phosphorylation in mitochondria. In addition, in terms of function, the inner chloroplast membrane, which regulates metabolite passage and synthesizes some materials, has no counterpart in the mitochondrion. The chloroplast membranes sometimes protrude out into the cytoplasm, forming a stromule, or stroma-containing tubule. Stromules are very rare in chloroplasts, and are much more common in other plastids like chromoplasts and amyloplasts in petals and roots, respectively. They may exist to increase the chloroplast's surface area for cross-membrane transport, because they are often branched and tangled with the endoplasmic reticulum. They were once thought to connect chloroplasts allowing them to exchange proteins, however recent research strongly refutes this idea. Observed stromules are probably just oddly shaped chloroplasts with constricted regions or dividing chloroplasts. 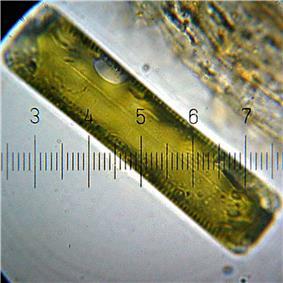 Glaucophyte algal chloroplasts have a peptidoglycan layer between the chloroplast membranes. It corresponds to the peptidoglycan cell wall of their cyanobacterial ancestors, which is located between their two cell membranes. These chloroplasts are called muroplasts (from Latin "mura", meaning "wall"). Other chloroplasts have lost the cyanobacterial wall, leaving an intermembrane space between the two chloroplast envelope membranes. Some chloroplasts contain a structure called the chloroplast peripheral reticulum. It is often found in the chloroplasts of C4 plants, though it has also been found in some C3 angiosperms, and even some gymnosperms. The chloroplast peripheral reticulum consists of a maze of membranous tubes and vesicles continuous with the inner chloroplast membrane that extends into the internal stromal fluid of the chloroplast. Its purpose is thought to be to increase the chloroplast's surface area for cross-membrane transport between its stroma and the cell cytoplasm. 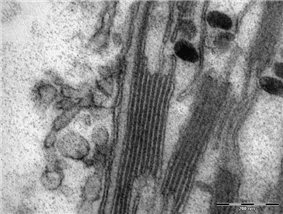 The small vesicles sometimes observed may serve as transport vesicles to shuttle stuff between the thylakoids and intermembrane space. Starch granules are simply accumulations of starch in the stroma, and are not bounded by a membrane. The chloroplasts of some hornworts and algae contain structures called pyrenoids. They are not found in higher plants. Pyrenoids are roughly spherical and highly refractive bodies which are a site of starch accumulation in plants that contain them. They consist of a matrix opaque to electrons, surrounded by two hemispherical starch plates. The starch is accumulated as the pyrenoids mature. 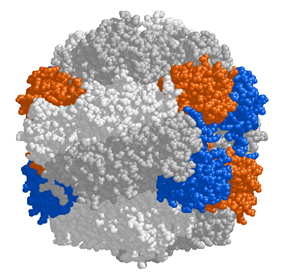 In algae with carbon concentrating mechanisms, the enzyme rubisco is found in the pyrenoids. Starch can also accumulate around the pyrenoids when CO2 is scarce. Pyrenoids can divide to form new pyrenoids, or be produced "de novo". Suspended within the chloroplast stroma is the thylakoid system, a highly dynamic collection of membranous sacks called thylakoids where chlorophyll is found and the light reactions of photosynthesis happen. In most vascular plant chloroplasts, the thylakoids are arranged in stacks called grana, though in certain C4 plant chloroplasts and some algal chloroplasts, the thylakoids are free floating. Using a light microscope, it is just barely possible to see tiny green granules—which were named grana. 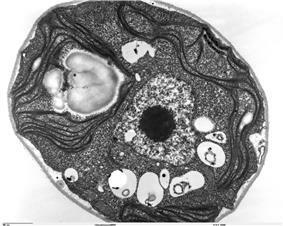 With electron microscopy, it became possible to see the thylakoid system in more detail, revealing it to consist of stacks of flat thylakoids which made up the grana, and long interconnecting stromal thylakoids which linked different grana. In the transmission electron microscope, thylakoid membranes appear as alternating light-and-dark bands, 8.5 nanometers thick. For a long time, the three-dimensional structure of the thylakoid system has been unknown or disputed. One model has the granum as a stack of thylakoids linked by helical stromal thylakoids; the other has the granum as a single folded thylakoid connected in a "hub and spoke" way to other grana by stromal thylakoids. While the thylakoid system is still commonly depicted according to the folded thylakoid model, it was determined in 2011 that the stacked and helical thylakoids model is correct. Thylakoids (sometimes spelled thylakoïds), are small interconnected sacks which contain the membranes that the light reactions of photosynthesis take place on. The word thylakoid comes from the Greek word thylakos which means "sack". In contrast, photosystem I and ATP synthase are large protein complexes which jut out into the stroma. They can't fit in the appressed granal membranes, and so are found in the stromal thylakoid membrane—the edges of the granal thylakoid disks and the stromal thylakoids. 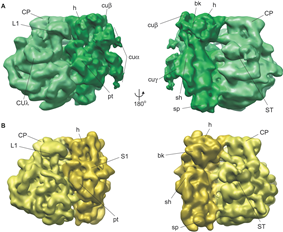 These large protein complexes may act as spacers between the sheets of stromal thylakoids. 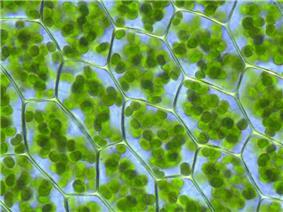 The chloroplasts of plant and algal cells can orient themselves to best suit the available light. In low-light conditions, they will spread out in a sheet—maximizing the surface area to absorb light. Under intense light, they will seek shelter by aligning in vertical columns along the plant cell's cell wall or turning sideways so that light strikes them edge-on. This reduces exposure and protects them from photooxidative damage. This ability to distribute chloroplasts so that they can take shelter behind each other or spread out may be the reason why land plants evolved to have many small chloroplasts instead of a few big ones. Chloroplast movement is considered one of the most closely regulated stimulus-response systems that can be found in plants. Mitochondria have also been observed to follow chloroplasts as they move. Studies of Vallisneria gigantea, an aquatic flowering plant, have shown that chloroplasts can get moving within five minutes of light exposure, though they don't initially show any net directionality. They may move along microfilament tracks, and the fact that the microfilament mesh changes shape to form a honeycomb structure surrounding the chloroplasts after they have moved suggests that microfilaments may help to anchor chloroplasts in place. Unlike most epidermal cells, the guard cells of plant stomata contain relatively well developed chloroplasts. However, exactly what they do is controversial. Plants lack specialized immune cells—all plant cells participate in the plant immune response. Chloroplasts, along with the nucleus, cell membrane, and endoplasmic reticulum, are key players in pathogen defense. Due to its role in a plant cell's immune response, pathogens frequently target the chloroplast. Plants have two main immune responses—the hypersensitive response, in which infected cells seal themselves off and undergo programmed cell death, and systemic acquired resistance, where infected cells release signals warning the rest of the plant of a pathogen's presence. Chloroplasts stimulate both responses by purposely damaging their photosynthetic system, producing reactive oxygen species. High levels of reactive oxygen species will cause the hypersensitive response. The reactive oxygen species also directly kill any pathogens within the cell. Lower levels of reactive oxygen species initiate systemic acquired resistance, triggering defense-molecule production in the rest of the plant. Chloroplasts can serve as cellular sensors. After detecting stress in a cell, which might be due to a pathogen, chloroplasts begin producing molecules like salicylic acid, jasmonic acid, nitric oxide and reactive oxygen species which can serve as defense-signals. As cellular signals, reactive oxygen species are unstable molecules, so they probably don't leave the chloroplast, but instead pass on their signal to an unknown second messenger molecule. All these molecules initiate retrograde signaling—signals from the chloroplast that regulate gene expression in the nucleus. Like mitochondria, chloroplasts use the potential energy stored in an H+, or hydrogen ion gradient to generate ATP energy. The two photosystems capture light energy to energize electrons taken from water, and release them down an electron transport chain. The molecules between the photosystems harness the electrons' energy to pump hydrogen ions into the thylakoid space, creating a concentration gradient, with more hydrogen ions (up to a thousand times as many) inside the thylakoid system than in the stroma. The hydrogen ions in the thylakoid space then diffuse back down their concentration gradient, flowing back out into the stroma through ATP synthase. ATP synthase uses the energy from the flowing hydrogen ions to phosphorylate adenosine diphosphate into adenosine triphosphate, or ATP. Because chloroplast ATP synthase projects out into the stroma, the ATP is synthesized there, in position to be used in the dark reactions. While named "the dark reactions", in most plants, they take place in the light, since the dark reactions are dependent on the products of the light reactions. The Calvin cycle starts by using the enzyme Rubisco to fix CO2 into five-carbon Ribulose bisphosphate (RuBP) molecules. The result is unstable six-carbon molecules that immediately break down into three-carbon molecules called 3-phosphoglyceric acid, or 3-PGA. The ATP and NADPH made in the light reactions is used to convert the 3-PGA into glyceraldehyde-3-phosphate, or G3P sugar molecules. Most of the G3P molecules are recycled back into RuBP using energy from more ATP, but one out of every six produced leaves the cycle—the end product of the dark reactions. Alternatively, glucose monomers in the chloroplast can be linked together to make starch, which accumulates into the starch grains found in the chloroplast. Under conditions such as high atmospheric CO2 concentrations, these starch grains may grow very large, distorting the grana and thylakoids. The starch granules displace the thylakoids, but leave them intact. Waterlogged roots can also cause starch buildup in the chloroplasts, possibly due to less sucrose being exported out of the chloroplast (or more accurately, the plant cell). This depletes a plant's free phosphate supply, which indirectly stimulates chloroplast starch synthesis. While linked to low photosynthesis rates, the starch grains themselves may not necessarily interfere significantly with the efficiency of photosynthesis, and might simply be a side effect of another photosynthesis-depressing factor. Because of the H+ gradient across the thylakoid membrane, the interior of the thylakoid is acidic, with a pH around 4, while the stroma is slightly basic, with a pH of around 8. The optimal stroma pH for the Calvin cycle is 8.1, with the reaction nearly stopping when the pH falls below 7.3. 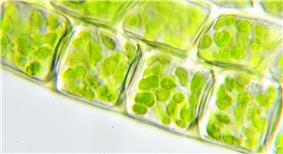 Chloroplasts alone make almost all of a plant cell's cytosol. Chloroplasts make all of a cell's purines and pyrimidines—the nitrogenous bases found in DNA and RNA. They also convert nitrite (NO2–) into ammonia (NH3) which supplies the plant with nitrogen to make its amino acids and nucleotides. Chloroplasts are the site of complex lipid metabolism. Chloroplasts are a special type of a plant cell organelle called a plastid, though the two terms are sometimes used interchangeably. There are many other types of plastids, which carry out various functions. All chloroplasts in a plant are descended from undifferentiated proplastids found in the zygote, or fertilized egg. Proplastids are commonly found in an adult plant's apical meristems. Chloroplasts do not normally develop from proplastids in root tip meristems—instead, the formation of starch-storing amyloplasts is more common. If  Gymnosperms do not require light to form chloroplasts. Plastid differentiation is not permanent, in fact many interconversions are possible. Chloroplasts may be converted to chromoplasts, which are pigment-filled plastids responsible for the bright colors you see in flowers and ripe fruit. Starch storing amyloplasts can also be converted to chromoplasts, and it is possible for proplastids to develop straight into chromoplasts. Chromoplasts and amyloplasts can also become chloroplasts, like what happens when you illuminate a carrot or a potato. If a plant is injured, or something else causes a plant cell to revert to a meristematic state, chloroplasts and other plastids can turn back into proplastids. Chloroplast, amyloplast, chromoplast, proplast, etc., are not absolute states—intermediate forms are common. Almost all chloroplasts in a cell divide, rather than a small group of rapidly dividing chloroplasts. Chloroplasts have no definite Arabidopsis and the red alga Cyanidioschyzon merolæ. The division process starts when the proteins FtsZ1 and FtsZ2 assemble into filaments, and with the help of a protein ARC6, form a structure called a Z-ring within the chloroplast's stroma. The Min system manages the placement of the Z-ring, ensuring that the chloroplast is cleaved more or less evenly. The protein MinD prevents FtsZ from linking up and forming filaments. Another protein ARC3 may also be involved, but it is not very well understood. These proteins are active at the poles of the chloroplast, preventing Z-ring formation there, but near the center of the chloroplast, MinE inhibits them, allowing the Z-ring to form. Next, the two plastid-dividing rings, or PD rings form. The inner plastid-dividing ring is located in the inner side of the chloroplast's inner membrane, and is formed first. 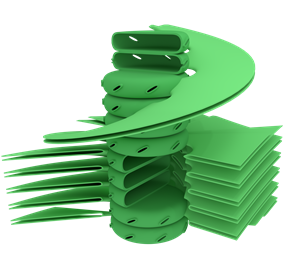 The outer plastid-dividing ring is found wrapped around the outer chloroplast membrane. It consists of filaments about 5 nanometers across, arranged in rows 6.4 nanometers apart, and shrinks to squeeze the chloroplast. This is when chloroplast constriction begins. In a few species like Cyanidioschyzon merolæ, chloroplasts have a third plastid-dividing ring located in the chloroplast's intermembrane space. Later, the dynamins migrate under the outer plastid dividing ring, into direct contact with the chloroplast's outer membrane, to cleave the chloroplast in two daughter chloroplasts. Many mechanisms prevent biparental chloroplast DNA inheritance including selective destruction of chloroplasts or their genes within the gamete or zygote, and chloroplasts from one parent being excluded from the embryo. Parental chloroplasts can be sorted so that only one type is present in each offspring. Angiosperms which pass on chloroplasts maternally have many ways to prevent paternal inheritance. Most of them produce sperm cells which do not contain any plastids. There are many other documented mechanisms that prevent paternal inheritance in these flowering plants, such as different rates of chloroplast replication within the embryo. ^ Mereschkowsky C (1905). "Über Natur und Ursprung der Chromatophoren im Pflanzenreiche" [About the nature and origin of chromatophores in the vegetable kingdom]. Biol Centralbl (in German) 25: 593–604. ^ Schimper AFW (1883). "Über die Entwicklung der Chlorophyllkörner und Farbkörper" [About the development of the chlorophyll grains and stains]. Bot. Zeitung (in German) 41: 105–14, 121–31, 137–46, 153–62. ^ a b c d Alberts, Bruce (2002). Molecular biology of the cell (4. ed.). New York [u.a. ]: Garland. ^ a b Kumar, K.; Mella-Herrera, R. A.; Golden, J. W. (2010). "Cyanobacterial Heterocysts". Cold Spring Harbor Perspectives in Biology 2 (4): a000315. ^ a b c d e f Biology 8th edition—Campbell&Reece. Benjamin Cummings. 2008. pp. 186–187. ^ a b c d e f g h i j k l m n o p q r s t u v w x y z aa ab ac ad ae af ag ah ai aj ak al am an ao ap aq ar as at au av aw ax ay az ba bb Kim, E.; Archibald, J. M. (2009). "Diversity and Evolution of Plastids and Their Genomes". In Sandelius, Anna Stina; Aronsson, Henrik. The Chloroplast. Plant Cell Monographs 13. pp. 1–39. ^ Bryant, Donald A.; Guglielmi, Gérard; Marsac, Nicole Tandeau; Castets, Anne-Marie; Cohen-Bazire, Germaine (1979). "The structure of cyanobacterial phycobilisomes: A model". Archives of Microbiology 123 (2): 311–34. ^ a b c d e f g h i j k l m n o p q r s t u v w x y z aa ab ac ad ae af ag ah Keeling, Patrick J. (2004). "Diversity and evolutionary history of plastids and their hosts". American Journal of Botany 91 (10): 1481–93. ^ a b c d McFadden, Geoffrey I; Van Dooren, Giel G (2004). 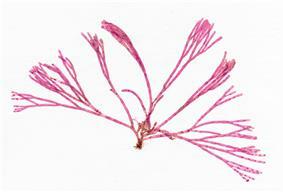 "Evolution: Red Algal Genome Affirms a Common Origin of All Plastids". Current Biology 14 (13): R514–6. ^ Fuks, Bruno; Fabrice Homblé (8 July 1996). "Mechanism of Proton Permeation through Chloroplast Lipid Membranes". Plant Physiology (112): 759–766. Retrieved 25 August 2013. ^ Joyard J Block MA, Douce R; Block; Douce (1991). "Molecular aspects of plastid envelope biochemistry". Eur J Biochem. 199 (3): 489–509. ^ "Chloroplast". Encyclopedia of Science. Retrieved 27 December 2012. ^ a b c d e f Nakayama, Takuro; Archibald, John M (2012). "Evolving a photosynthetic organelle". BMC Biology 10: 35. ^ a b c d e McFadden, G. I. (2001). "Chloroplast Origin and Integration". Plant Physiology 125 (1): 50–3. ^ Archibald, John M. (2009). "The Puzzle of Plastid Evolution". Current Biology 19 (2): R81–8. ^ a b c d e f g h i j k l m n o p q r s t u v w Wise, edited by Robert R.; Hoober, J. Kenneth (2006). The structure and function of plastids. Dordrecht: Springer. pp. 3–21. ^ a b Ball, S.; Colleoni, C.; Cenci, U.; Raj, J. N.; Tirtiaux, C. (2011). "The evolution of glycogen and starch metabolism in eukaryotes gives molecular clues to understand the establishment of plastid endosymbiosis". Journal of Experimental Botany 62 (6): 1775–801. ^ a b c d e Nair, Sethu C.; Striepen, Boris (2011). "What Do Human Parasites Do with a Chloroplast Anyway?". PLoS Biology 9 (8): e1001137. ^ a b c d e f g h i j k l m n o p q r s t u v w x y z aa ab ac ad ae af ag ah ai Keeling, P. J. (2010). "The endosymbiotic origin, diversification and fate of plastids". Philosophical Transactions of the Royal Society B: Biological Sciences 365 (1541): 729–48. ^ a b c d e f g h i j Biology 8th Edition Campbell & Reece. Benjamin Cummings (Pearson). 2009. pp. 582–92. ^ "rhodo-". The Free Dictionary. Farlex. Retrieved 2013-06-07. ^ a b Lewis, L. A.; McCourt, R. M. (2004). "Green algae and the origin of land plants". American Journal of Botany 91 (10): 1535–56. ^ Machida, M.; Takechi, K; Sato, H; Chung, SJ; Kuroiwa, H; Takio, S; Seki, M; Shinozaki, K; Fujita, T; Hasebe, M; Takano, H (2006). "Genes for the peptidoglycan synthesis pathway are essential for chloroplast division in moss". Proceedings of the National Academy of Sciences 103 (17): 6753–8. ^ Moroney, J. V.; Somanchi, A (1999). "How Do Algae Concentrate CO2 to Increase the Efficiency of Photosynthetic Carbon Fixation?". Plant Physiology 119 (1): 9–16. ^ Tartar, Aurã©Lien; Boucias, Drion G. (2004). "The non-photosynthetic, pathogenic green algaHelicosporidiumsp. 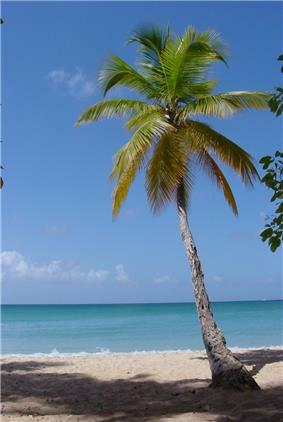 Has retained a modified, functional plastid genome". FEMS Microbiology Letters 233 (1): 153–7. ^ a b Chaal, Balbir K.; Green, Beverley R. (February 2005). "Protein import pathways in 'complex' chloroplasts derived from secondary endosymbiosis involving a red algal ancestor". Plant Molecular Biology 57 (3): 333–42. ^ a b c Moustafa, Ahmed; Beszteri, Bánk; Maier, Uwe G.; Bowler, Chris; Valentin, Klaus; Bhattacharya, Debashish (2009). "Genomic Footprints of a Cryptic Plastid Endosymbiosis in Diatoms". Science 324 (5935): 1724–6. ^ Rogers, M. B.; Gilson, P. R.; Su, V.; McFadden, G. I.; Keeling, P. J. (2006). "The Complete Chloroplast Genome of the Chlorarachniophyte Bigelowiella natans: Evidence for Independent Origins of Chlorarachniophyte and Euglenid Secondary Endosymbionts". Molecular Biology and Evolution 24 (1): 54–62. ^ a b c d e f g h i j k l m n Hackett, J. D.; Anderson, D. M.; Erdner, D. L.; Bhattacharya, D. (2004). "Dinoflagellates: A remarkable evolutionary experiment". American Journal of Botany 91 (10): 1523–34. ^ Dorrell, R. G.; Smith, A. G. (2011). "Do Red and Green Make Brown? : Perspectives on Plastid Acquisitions within Chromalveolates". Eukaryotic Cell 10 (7): 856–68. ^ Meeson, B. W.; Chang, S. S.; Sweeney, B. M. (1982). "Characterization of Peridinin-Chlorophyll α-Proteins from the Marine Dinoflagellate Ceratium furca". Botanica Marina 25 (8): 347–50. ^ a b c Schnepf, Eberhard; Elbrächter, Malte (1999). "Dinophyte chloroplasts and phylogeny - A review". Grana 38 (2–3): 81–97. ^ a b c d Nowack, E. C. M.; Vogel, H.; Groth, M.; Grossman, A. R.; Melkonian, M.; Glöckner, G. (2010). "Endosymbiotic Gene Transfer and Transcriptional Regulation of Transferred Genes in Paulinella chromatophora". Molecular Biology and Evolution 28 (1): 407–22. ^ a b c d e Dann, Leighton (2002). Bioscience—Explained. Green DNA: BIOSCIENCE EXPLAINED. ^ a b c d e Clegg, M. T.; Gaut, BS; Learn Jr, GH; Morton, BR (1994). "Rates and Patterns of Chloroplast DNA Evolution". Proceedings of the National Academy of Sciences 91 (15): 6795–801. ^ a b c d e f Shaw, J.; Lickey, E. B.; Schilling, E. E.; Small, R. L. (2007). "Comparison of whole chloroplast genome sequences to choose noncoding regions for phylogenetic studies in angiosperms: The tortoise and the hare III". American Journal of Botany 94 (3): 275–88. ^ Skovgaard, Alf (1998). "Role of chloroplast retention in a marine dinoflagellate". Aquatic Microbial Ecology 15: 293–301. ^ "ctDNA — chloroplast DNA". AllAcronyms.com. Retrieved 2 January 2013. ^ "Chloroplasts and Other Plastids". University of Hamburg. Retrieved 27 December 2012. ^ a b c d e f g Sandelius, Anna Stina (2009). The Chloroplast: Interactions with the Environment. Springer. p. 18. ^ a b Burgess, Jeremy (1989). An introduction to plant cell development. Cambridge: Cambridge university press. p. 62. ^ Bendich, A. J. (2004). "Circular Chloroplast Chromosomes: The Grand Illusion". The Plant Cell Online 16 (7): 1661–6. ^ a b c Kolodner, R.; Tewari, KK (1979). "Inverted Repeats in Chloroplast DNA from Higher Plants". Proceedings of the National Academy of Sciences 76 (1): 41–5. ^ a b Palmer, Jeffrey D.; Thompson, William F. (1982). "Chloroplast DNA rearrangements are more frequent when a large inverted repeat sequence is lost". Cell 29 (2): 537–50. ^ Plant Biochemistry (3rd ed.). Academic Press. 2005. p. 517. ^ a b Kobayashi, T.; Takahara, M; Miyagishima, SY; Kuroiwa, H; Sasaki, N; Ohta, N; Matsuzaki, M; Kuroiwa, T (2002). "Detection and Localization of a Chloroplast-Encoded HU-Like Protein That Organizes Chloroplast Nucleoids". The Plant Cell Online 14 (7): 1579–89. ^ a b Alberts, Bruce (2002). Molecular biology of the cell (4. ed. ed.). New York [u.a. ]: Garland. ^ Huang, Chun Y.; Ayliffe, Michael A.; Timmis, Jeremy N. (2003). "Direct measurement of the transfer rate of chloroplast DNA into the nucleus". Nature 422 (6927): 72–6. ^ a b c Martin, W.; Rujan, T; Richly, E; Hansen, A; Cornelsen, S; Lins, T; Leister, D; Stoebe, B; Hasegawa, M; Penny, D (2002). "Evolutionary analysis of Arabidopsis, cyanobacterial, and chloroplast genomes reveals plastid phylogeny and thousands of cyanobacterial genes in the nucleus". Proceedings of the National Academy of Sciences 99 (19): 12246–51. ^ Archibald, John M. (2006). "Algal Genomics: Exploring the Imprint of Endosymbiosis". Current Biology 16 (24): R1033–5. ^ Koussevitzky, Shai; Nott, A; Mockler, TC; Hong, F; Sachetto-Martins, G; Surpin, M; Lim, J; Mittler, R; Chory, J (2007). "Signals from Chloroplasts Converge to Regulate Nuclear Gene Expression". Science 316 (5825): 715–9. ^ Hedtke, B.; Börner, T; Weihe, A (1997). "Mitochondrial and Chloroplast Phage-Type RNA Polymerases in Arabidopsis". Science 277 (5327): 809–11. ^ Harris, EH; Boynton, JE; Gillham, NW (1994). "Chloroplast ribosomes and protein synthesis". Microbiological reviews 58 (4): 700–54. ^ a b c d e f g h i j Soll, Jürgen; Schleiff, Enrico (2004). "Plant cell biology: Protein import into chloroplasts". Nature Reviews Molecular Cell Biology 5 (3): 198–208. ^ a b Biology 8th edition—Campbell & Reece. Benjamin Cummings. 2008. p. 340. ^ Lung, S.-C.; Chuong, S. D. X. (2012). "A Transit Peptide-Like Sorting Signal at the C Terminus Directs the Bienertia sinuspersici Preprotein Receptor Toc159 to the Chloroplast Outer Membrane". The Plant Cell 24 (4): 1560–78. ^ Soll, J r.; Soll, J (1996). "Phosphorylation of the Transit Sequence of Chloroplast Precursor Proteins". Journal of Biological Chemistry 271 (11): 6545–54. ^ a b May, T. (2000). "14-3-3 Proteins Form a Guidance Complex with Chloroplast Precursor Proteins in Plants". The Plant Cell Online 12: 53. ^ Jarvis, Paul; Soll, Jürgen (2001). "Toc, Tic, and chloroplast protein import". Biochimica et Biophysica Acta (BBA) - Molecular Cell Research 1541 (1–2): 64–79. ^ Wise, R.R. ; Hoober, J.K. (2007). The Structure and Function of Plastids. Springer. pp. 32–33. ^ "Oedogonium Link ex Hirn, 1900: 17". algaeBASE. Retrieved 19 May 2013. ^ "Chlamydomonas Ehrenberg, 1833: 288". algaeBASE. Retrieved 19 May 2013. ^ "Spirogyra Link, 1820: 5". algaeBASE. Retrieved 19 May 2013. ^ "Sirogonium Kützing, 1843: 278". algaeBASE. Retrieved 19 May 2013. ^ "Zygnema C.Agardh, 1817: xxxii, 98". algaeBASE. Retrieved 19 May 2013. ^ "Micrasterias C.Agardh ex Ralfs, 1848: 68". algaeBASE. Retrieved 19 May 2013. ^ John, D.M. ; Brook, A.J. ; Whitton, B.A. (2002). The freshwater algal flora of the British Isles : an identification guide to freshwater and terrestrial algae. Cambridge: Cambridge University Press. p. 335. ^ a b c d e f g Biology 8th edition—Campbell & Reece. Benjamin Cummings. 2008. pp. 196–197. ^ Koike, H.; Yoshio, M.; Kashino, Y.; Satoh, K. (1998). "Polypeptide Composition of Envelopes of Spinach Chloroplasts: Two Major Proteins Occupy 90% of Outer Envelope Membranes". Plant and Cell Physiology 39 (5): 526–32. ^ Köhler RH, Hanson MR (1 January 2000). "Plastid tubules of higher plants are tissue-specific and developmentally regulated". J. Cell. Sci. 113 (Pt 1): 81–9. ^ Gray JC, Sullivan JA, Hibberd JM, Hansen MR (2001). "Stromules: mobile protrusions and interconnections between plastids". Plant Biology 3 (3): 223–33. ^ Schattat, M.; Barton, K.; Baudisch, B.; Klösgen, R. B.; Mathur, J. (2011). "Plastid Stromule Branching Coincides with Contiguous Endoplasmic Reticulum Dynamics". Plant Physiology 155 (4): 1667–77. ^ Schattat, M. H.; Griffiths, S.; Mathur, N.; Barton, K.; Wozny, M. R.; Dunn, N.; Greenwood, J. S.; Mathur, J. (2012). "Differential Coloring Reveals That Plastids Do Not Form Networks for Exchanging Macromolecules". The Plant Cell 24 (4): 1465–77. ^ a b c d e f g h i j Burgess,, Jeremy (1989). An introduction to plant cell development ([Pbk. ed.). Cambridge: Cambridge university press. p. 46. ^ a b Whatley, Jean M (5 July 1994). "The occurrence of a peripheral reticulum in plastids of the gymnosperm Welwitschia mirabilis". New Phytologist 74 (2): 215–220. ^ a b c Wise, Robert R (2007). The Structure and Function of Plastids. Springer. pp. 17–18. ^ Manuell, Andrea L.; Quispe, Joel; Mayfield, Stephen P. (2007). "Structure of the Chloroplast Ribosome: Novel Domains for Translation Regulation". PLoS Biology 5 (8): e209. ^ a b c d e f g h i j Austin, J. R.; Frost, E; Vidi, PA; Kessler, F; Staehelin, LA (2006). 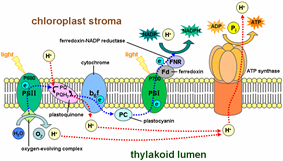 "Plastoglobules Are Lipoprotein Subcompartments of the Chloroplast That Are Permanently Coupled to Thylakoid Membranes and Contain Biosynthetic Enzymes". The Plant Cell Online 18 (7): 1693–703. ^ a b Crumpton-Taylor, M.; Grandison, S.; Png, K. M. Y.; Bushby, A. J.; Smith, A. M. (2011). "Control of Starch Granule Numbers in Arabidopsis Chloroplasts". Plant Physiology 158 (2): 905–16. ^ Zeeman, Samuel C.; Delatte, Thierry; Messerli, Gaëlle; Umhang, Martin; Stettler, Michaela; Mettler, Tabea; Streb, Sebastian; Reinhold, Heike; Kötting, Oliver (2007). "Starch breakdown: Recent discoveries suggest distinct pathways and novel mechanisms". Functional Plant Biology 34 (6): 465–73. ^ J D, Rochaix (1998). The molecular biology of chloroplasts and mitochondria in Chlamydomonas. Dordrecht [u.a. ]: Kluwer Acad. Publ. pp. 550–565. ^ a b c d e f Steer, Brian E.S. Gunning, Martin W. (1996). Plant cell biology : structure and function. Boston, Mass. : Jones and Bartlett Publishers. p. 24. ^ Hanson, David; Andrews, T. John; Badger, Murray R. (2002). "Variability of the pyrenoid-based CO2 concentrating mechanism in hornworts (Anthocerotophyta)". Functional Plant Biology 29 (3): 407–16. ^ a b Ma, Y.; Pollock, S. V.; Xiao, Y.; Cunnusamy, K.; Moroney, J. V. (2011). "Identification of a Novel Gene, CIA6, Required for Normal Pyrenoid Formation in Chlamydomonas reinhardtii". Plant Physiology 156 (2): 884–96. ^ a b Retallack, B; Butler, RD (1970). "The development and structure of pyrenoids in Bulbochaete hiloensis". Journal of Cell Science 6 (1): 229–41. ^ Brown, Malcolm R; Howard J Arnott (1970). "Structure and Function of the Algal Pyrenoid". Journal of Phycology. ^ a b c d e f Mustardy, L.; Buttle, K.; Steinbach, G.; Garab, G. (2008). "The Three-Dimensional Network of the Thylakoid Membranes in Plants: Quasihelical Model of the Granum-Stroma Assembly". The Plant Cell Online 20 (10): 2552–7. ^ a b c Austin, J. R.; Staehelin, L. A. (2011). "Three-Dimensional Architecture of Grana and Stroma Thylakoids of Higher Plants as Determined by Electron Tomography". Plant Physiology 155 (4): 1601–11. ^ "The Chloroplast Import Receptor Toc90 Partially Restores the Accumulation of Toc159 Client Proteins in the Arabidopsis thaliana ppi2 Mutant". Molecular Plant. Retrieved 19 May 2013. ^ "thylakoid". Merriam-Webster Dictionary. Merriam-Webster. Retrieved 19 May 2013. ^ "Australian scientists discover first new chlorophyll in 60 years". University of Sydney. 20 August 2010. ^ a b c Takaichi, Shinichi (15 June 2011). "Carotenoids in Algae: Distributions, Biosyntheses and Functions". Marine Drugs 9 (12): 1101–1118. ^ Shapley, Dan. "Why Do Leaves Change Color in Fall?". News Articles. The Daily Green. Retrieved 21 May 2013. ^ a b Howe, C.J; Barbrook, A.C; Nisbet, R.E.R; Lockhart, P.J; Larkum, A.W.D (2008). "The origin of plastids". Philosophical Transactions of the Royal Society B: Biological Sciences 363 (1504): 2675–85. ^ "Introduction to the Rhodophyta". University of California Museum of Paleontology. Retrieved 20 May 2013. ^ Lawton, June R (March 1988). "Ultrastructure of Chloroplast Membranes in Leaves of Maize and Ryegrass as Revealed by Selective Staining Methods". New Phytologist 108 (3): 277–283. ^ Roberts, editor, Keith (2007). Handbook of plant science. Chichester, West Sussex, England: Wiley. p. 16. ^ Biology 8th edition—Campbell&Reece. Benjamin Cummings. 2008. p. 742. ^ a b "Guard Cell Photosynthesis". Plant Physiology Online. Sinauer. Retrieved 14 April 2013. ^ a b Eckardt, N. A. (2003). "Controlling Organelle Positioning: A Novel Chloroplast Movement Protein". The Plant Cell Online 15 (12): 2755–7. ^ a b c d e f g h i j k l m Glynn, Jonathan M.; Miyagishima, Shin-ya; Yoder, David W.; Osteryoung, Katherine W.; Vitha, Stanislav (2007). "Chloroplast Division". Traffic 8 (5): 451–61. ^ a b Dong, X.-J. ; Nagai, R.; Takagi, S. (1998). "Microfilaments Anchor Chloroplasts along the Outer Periclinal Wall in Vallisneria Epidermal Cells through Cooperation of PFR and Photosynthesis". Plant and Cell Physiology 39 (12): 1299–306. ^ a b c Takagi, Shingo (December 2002). "Actin-based photo-orientation movement of chloroplasts in plant cells". Journal of Experimental Biology (206): 1963–1969. Retrieved 6 March 2013. ^ Zeiger, E.; Talbott, L. D.; Frechilla, S.; Srivastava, A.; Zhu, J. (2002). "The guard cell chloroplast: A perspective for the twenty-first century". New Phytologist 153 (3): 415. ^ a b c d e f g Padmanabhan, Meenu S.; Dinesh-Kumar, S. P. (2010). "All Hands on Deck—The Role of Chloroplasts, Endoplasmic Reticulum, and the Nucleus in Driving Plant Innate Immunity". Molecular Plant-Microbe Interactions 23 (11): 1368–80. ^ Katsir, Leron; Chung, Hoo Sun; Koo, Abraham JK; Howe, Gregg A (2008). "Jasmonate signaling: A conserved mechanism of hormone sensing". Current Opinion in Plant Biology 11 (4): 428–35. ^ Schnurr, J. A.; Shockey, JM; De Boer, GJ; Browse, JA (2002). "Fatty Acid Export from the Chloroplast. Molecular Characterization of a Major Plastidial Acyl-Coenzyme a Synthetase from Arabidopsis". Plant Physiology 129 (4): 1700–9. ^ Campbell, Neil A.; Williamson, Brad; Heyden, Robin J. (2006). Biology: Exploring Life. Boston, Massachusetts: Pearson Prentice Hall. ^ a b Clarke, Jeremy M. Berg; John L. Tymoczko; Lubert Stryer. Web content by Neil D. (2002). Biochemistry (5. ed., 4. print. ed.). New York, NY [u.a. ]: W. H. Freeman. pp. Section 19.4. ^ a b Clarke, Jeremy M. Berg; John L. Tymoczko; Lubert Stryer. Web content by Neil D. (2002). Biochemistry (5. ed., 4. print. ed.). New York, NY [u.a. ]: W. H. Freeman. pp. Section 20.1. ^ a b c Wample, R. L.; Davis, R. W. (1983). "Effect of Flooding on Starch Accumulation in Chloroplasts of Sunflower (Helianthus annuus L.)". Plant Physiology 73 (1): 195–8. ^ Carmi, A.; Shomer, I. (1979). L.)"Phaseolus vulgaris"Starch Accumulation and Photosynthetic Activity in Primary Leaves of Bean (. Annals of Botany 44 (4): 479–484. ^ Berg JM; Tymoczko JL; Stryer L. (2002). Biochemistry. (5th ed.). W H Freeman. pp. Section 19.4. Retrieved 30 October 2012. ^ a b c Hauser, M; Eichelmann, H; Oja, V; Heber, U; Laisk, A (1995). as Indicated by CO2 Solubilization in Leaves"in Vivo"Stimulation by Light of Rapid pH Regulation in the Chloroplast Stroma . Plant physiology 108 (3): 1059–1066. ^ a b Werdan, Karl; Heldt, Hans W.; Milovancev, Mirjana (1975). "The role of pH in the regulation of carbon fixation in the chloroplast stroma. Studies on CO2 fixation in the light and dark". Biochimica et Biophysica Acta (BBA) - Bioenergetics 396 (2): 276–92. ^ a b c d e f g Burgess,, Jeremy (1989). An introduction to plant cell development ([Pbk. ed.). Cambridge: Cambridge university press. p. 56. ^ Ferro, Myriam; Daniel Salvi; Hélène Rivière-Rolland; Thierry Vermat; Daphné Seigneurin-Berny; Didier Grunwald; Jérôme Garin; Jacques Joyard; Norbert Rolland (20 August 2002). "Integral membrane proteins of the chloroplast envelope: Identification and subcellular localization of new transporters". Proceedings of the National Academy of Sciences (of the USA) 99 (17): 11487–11492. ^ a b Rolland, Norbert; Michel Droux and Roland Douce (March 1992). "Subcellular Distribution of O-Acetylserine(thiol)lyase in Cauliflower (Brassica oleracea L.) Inflorescence". Plant Physiology 98 (3): 927–935. ^ Ravanel, Stéphane; Bertrand Gakière; Dominique Job; Roland Douce (23 June 1998). "The specific features of methionine biosynthesis and metabolism in plants". Proceedings of the National Academy of Sciences (in the USA) 95 (13): 7805–7812. ^ Joyard, Jacques; Ferro, Myriam; Masselon, Christophe; Seigneurin-Berny, Daphné; Salvi, Daniel; Garin, Jérôme; Rolland, Norbert (2010). "Chloroplast proteomics highlights the subcellular compartmentation of lipid metabolism". Progress in Lipid Research 49 (2): 128–58. ^ Steer, Brian E.S. Gunning, Martin W. (1996). Plant cell biology : structure and function. Boston, Mass. : Jones and Bartlett Publishers. p. 20. ^ a b c d e f Burgess,, Jeremy (1989). An introduction to plant cell development ([Pbk. ed.). Cambridge: Cambridge university press. pp. 54–55. ^ Burgess,, Jeremy (1989). An introduction to plant cell development ([Pbk. ed.). Cambridge: Cambridge university press. p. 57. ^ a b Possingham, J. V.; Rose, R. J. (1976). "Chloroplast Replication and Chloroplast DNA Synthesis in Spinach Leaves". Proceedings of the Royal Society B: Biological Sciences 193 (1112): 295–305. ^ Heinhorst, S; G.C. Cannon (January 1993). "DNA replication in chloroplasts". Journal of Cell Science 104 (104): 1–9. Retrieved 3 February 2013. ^ a b c d e f g h i j Miyagishima, S.-y. ; Nishida, K; Mori, T; Matsuzaki, M; Higashiyama, T; Kuroiwa, H; Kuroiwa, T (2003). "A Plant-Specific Dynamin-Related Protein Forms a Ring at the Chloroplast Division Site". The Plant Cell Online 15 (3): 655–65. ^ a b Hashimoto, H.; Possingham, J. V. (1989). "Effect of Light on the Chloroplast Division Cycle and DNA Synthesis in Cultured Leaf Discs of Spinach". Plant Physiology 89 (4): 1178–83. ^ a b c d Hansen, A. K.; Escobar, L. K.; Gilbert, L. E.; Jansen, R. K. (2007). "Paternal, maternal, and biparental inheritance of the chloroplast genome in Passiflora (Passifloraceae): Implications for phylogenetic studies". American Journal of Botany 94 (1): 42–6. ^ Birky, C. William (1995). "Uniparental Inheritance of Mitochondrial and Chloroplast Genes: Mechanisms and Evolution". Proceedings of the National Academy of Sciences of the United States of America 92 (25): 11331–8. ^ Powell W, Morgante M, McDevitt R, Vendramin GG, Rafalski JA (August 1995). "Polymorphic simple sequence repeat regions in chloroplast genomes: applications to the population genetics of pines". Proc. Natl. Acad. Sci. U.S.A. 92 (17): 7759–63. ^ Stegemann, S.; Hartmann, S; Ruf, S; Bock, R (2003). "High-frequency gene transfer from the chloroplast genome to the nucleus". Proceedings of the National Academy of Sciences 100 (15): 8828–33. ^ a b Ruf, S.; Karcher, D.; Bock, R. (2007). "Determining the transgene containment level provided by chloroplast transformation". Proceedings of the National Academy of Sciences 104 (17): 6998–7002. Clegg, M. T.; Gaut, BS; Learn Jr, GH; Morton, BR (1994). "Rates and Patterns of Chloroplast DNA Evolution". Proceedings of the National Academy of Sciences 91 (15): 6795–801.